9000 Freeport Drive, Denton, TX.| MLS# 14044254 | Robson Ranch, Denton TX Active Adult community with 100 activities and clubs. Robson Ranch allows the resident to focus on an active mind and a busy body that extends ones live span. Ideal for "empty nesters". Golf Carts Rule. Full of natural sunlight. 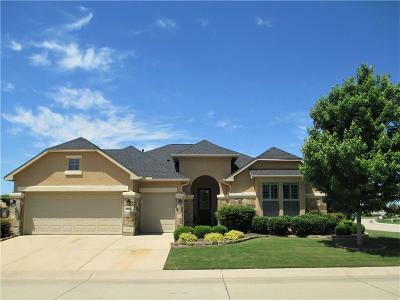 This Teravista home is clean, neat and ready for you. Stone and stucco. Large fenced yard with freshly mulched flower beds and budding tree's. Extended patio with pergola cover. Kitchen with granite, island with seating, under cabinet lighting, GENIE heavy duty roll out shelves, SS Kitchen Aid Appliances. Breakfast room large enough for dining room furniture, all opened to the family room that has double crown molding and a open wall for your large screen TV. Master with sitting area, extended closet and spacious bathroom vanity. Mini master with walk in closet. Office. Texas Star door, split plantation shutters, vinyl windows, radiant barrier, attic flooring, Roof in 2017.